Whether due to terrific bad luck or mono-cultural planting of vines in Europe in the early 1860s, when a particularly prolific and persistent aphid called phylloxera stowed away in the roots of some American vines on a steam ship from the US it took 40 years for the French wine industry to recover from its effects. First it took a long time to identify the cause that laid waste to at least two-thirds of European vineyards. Then various methods to try to stop it failed to work; this ranged from toads, hens and tobacco to chemical sprays and wee – bizarrely in Beaujolais, schoolboys were taken from their classrooms twice a day to urinate over vines. Eventually grafting European vines onto the American root-stock which had harboured the disease (and was also resistant to it) was adopted, with large-scale replanting of French vineyards commencing in the 1890s. No wonder the French held a grudge. So in 1976 when a prominent British wine merchant, organised a high-profile blind tasting of top wines from Bordeaux against upstarts from California, named the judgement of Paris, just imagine how much salt must have been poured in old wounds when a Cabernet Sauvignon from Stag’s Leap, USA, won. Was it luck, bad voting methodology or meticulous study of French winemaking practices and techniques by the Americans which led to this outcome? It’s still open to debate. My eagerness to taste wines from two of the American wineries which were included in the Judgement of Paris meant I was among the first to arrive at Cave in Conrad, Dubai. Pah to the whites, I politely sipped some Stag’s Leap Sauvignon Blanc and then abandoned it to leap (like a stag?) into the reds. Whether the French care to admit it or not, the influence that at first went one way across the Atlantic has come back in the other direction. For one, the scores given by Robert Parker’s (critic of The Wine Spectator) can impact on the sale of a wine to such a degree that wine makers may have pandered to the styles he rates most highly. Would I be able to detect a difference between French wines and these stellar names from the US? 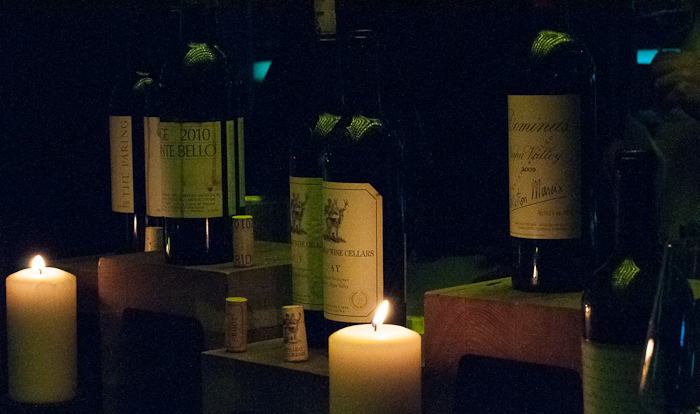 The green lighting in Cave means that it’s always difficult to judge the colour of the wine. Angling it by a candle (oh why do they use vanilla scented ones at a wine tasting?) over a white plate it seems to be medium intensity, with a watery purple rim – but don’t quote me. The nose takes me into Jo Malone. There is no need to drink this. I can just stand here all night inhaling. Dark lush berries, deep cedar with an edge given through a vegetal, mossy note and graphite (pencil shavings). Not quite so soft and lush on the palate sadly, this still needs age to round the slightly tight tannins. Cigar box and blackcurrants, and the finish of black, cherry sweets and hints of liquorice persist satisfyingly. This is much more nuanced on the nose after the Ridge with cigar box and cedar prominent and reticent black fruits which take a while to develop into layers of spice and mocha. There is a strange, not unpleasant, dustiness on the palate reminiscent of dried thyme, leading to soft mulberries, tobacco and significant length. Balanced, lean, subtle – a wine for the head and the heart and with loads of aging potential. Clean summer fruit nose with tiny pops of vanilla and elusive wafts of tar – like sniffing ‘Black Jack’ sweets. Rounded, soft, velvety, luscious summer pudding fruits on the palate, an exquisite soft mouthfeel, violet freshness and a slight graphite, cooked cherry finish. I wanted to tuck this bottle away and finish it off curled up on the sofa. Sadly I mentioned this to all my companions and they agreed so I didn’t get to taste anymore. Expecting this one to be ultra-heavy, I was a bit reluctant to break the spell of the last wine. The nose totally shocked me – it was like a Dime bar – coffee, chocolate, caramel with a little bit of raisin. The taste was not the assault that I thought it would be despite all the descriptions that now follow. A mouth full of soft black fruits with a hint of tar and lots of milk chocolate and vanilla, blackcurrant sweets and tobacco. Very un-French in style – if this had been in the judgement it would have stood out a mile… but I’m longing to taste it again with a great piece of sirloin. I probably didn’t do this justice by tasting it last. Bright cherry and vanilla on the nose, the blackcurrant and vanilla in the mouth potentially deserve the term ‘fruit bomb’ but acidity saves it from tipping over the edge into ‘Molly Dooker’ land. Will buy some to taste on its own without such stellar companions. Maybe coincidence, but unlike most of the other Le Clos tasting sessions, I didn’t hear one French accent in the room. So my personal conclusion from this tasting is that, apart from the Dominus, these Californian wines have their own distinct styles, very different from Bordeaux. Forward rounded fruits and masses oak driven aromas and flavours; these are showier and accessible wines but with plenty of complexity to keep them interesting. The Dominus had most affinity with Bordeaux probably due to French owner and acclaimed winemaker Christian Moueix at the helm. So is it luck that the French still remain the benchmark of fine wine standards in the world – or do they? (In this 2011 article Andrew Jefford deems the Bordelais very lucky.) Would love to hear your thoughts. *All prices at time of writing for Le Clos at Al Hamra Cellar – most also available at Le Clos in Dubai airport terminal 3 concourse A and B. Entering this post for the Monthly Wine Writing Challenge #8 (MWWC#8). This month’s topic – LUCK was chosen by last month’s winner The Sweet Sommelier. Read more about the challenge here. Most American wines I’ve tasted were great. A lovely selection of wines. I wish I could find them here. We don’t get a lot of US wine here Rosa – too far to come and too expensive I guess. I agree that generally, usually and in my experience (how’s that for qualifying? ), American wine like most has its own trademark that’s different than Bordeaux. I think that’s good. Why make everything to taste the same? Haven’t had most of these but the Monte Bello is a fav of mine. Well written. I could almost taste them myself. A fascinating piece. My view is that French wines still rule the roost, though I admit happily that this view may well be rooted in tradition rather than todays’s reality. I have tasted many wines from the US and, whilst they deliver some great bottles, something is still missing for me. Moe interesting perhaps are the wines from South America, notably Chile. Are they ‘better’ than French wines? No, just different and equally worthy of our attention, When did this become a competition? I enjoyed these in a completely different way to French wines and enjoy different styles. I suppose anything’s a competition when there is money involved. So glad this grabbed your interest however – always makes my day when I get a pat on the back from you. First of all, thanks for the great post, Sally. And based on my own experience, I agree with Dave Reeder about ‘something missing’ in non-French wines. It might be associated with emotions or people’s palate. I can’t put my finger on it but there is a certain element in French wines, I’m talking about average wines, that is unique in the smell for me. Sally I love your wine posts, just a shame I can’t drink any at the moment. Always so informative and interesting.My sister lives near a winery in Washington State and I have to say, I do enjoy a good US wine having tasted quite a few over there. You’ll have to save up a special bottle or two for after the happy event Ren. Reading this from the sofa & am definitely about to reach for a glass of red now I’ve read your tempting descriptions. Afraid it’s French – but you’ve made me want to try lots more American reds. Feeling’s mutual – loved the opening paragraph of your MWWC post. Had me hook, line and sinker! Great post and very nice tasting, Sally (despite the poor lighting and the scented candles)! Oh well, fortunately it’s all in the past now and we can enjoy great wines from both the old and the new worlds! Thanks Stefano – it’s actually a lovely tasting space – just get a bit geeky when I get the opportunity to try something extra special. Monte Bello is my all-time favorite American wine. It can age beautifully and has an elegant, restrained side that I greatly appreciate. A classic. And Dominus is on my short list of Napa favorites. Would be nice for you to taste some older vintages of both. I think so Jameson – the promise on the nose of the Monte Bello didn’t quite come through on the palate – think it had loads of room to develop further. Thanks for commenting. Fabulous tasting line up, lucky you! Sally-You were paying much more attention that night than I, being diligent with note taking etc. My lingering memories are of the “nose” on the Stag’s Leap which was a vanilla toffee/butterscotch and slight burnt match aroma-intoxicating and very much saying “Now you must drink me”. The Dominus had a very Fr. personality and that truly is Christian’s influence, I believe. The MonteBello will be great in 10 years. It’s good now but it will be better later. They are serious about great wine at Ridge and I’ve tasted a 1978 that still had “it” back in 2010. It has “the chops” to stand the test beyond 30 years in bottle in my opinion. After all was done, or should I say poured? my favorite of the night was the Coup de Foudre. It was my first experience tasting it and is showing well now plus has evident secondary and tertiary aromas wafting from the glass but as with the entire flight it needs time in bottle in a cool dark cellar to really bring out it’s true potential. All of these reds were young and have years left on them for enjoyment into the 2030’s and beyond. As others have commented, American wines are different from their European cousins-and they should be. Unique terroir and unrestricted appellation farming gives the US winemaker a freedom that the AOC/DOCG etc system in Europe forbids….by law. They also deal with different pests and remedies to save the grapes from them. As a French wine fan holding an American passport I won’t say better, worse or lucky. Depends on what I’m eating and how much change is in my pocket when I’m in the shop looking for an appropriate bottle. Variety is important and I highly recommend that anyone interested in something different be adventurous and give it a try… you never know what you may find. As far as the French and their luck: The “luck” is built around a codified system of legal parameters that govern farming and wine production coupled with an amazing federal effort to market the product world wide with prestige and a sense of uniqueness-look at the big Champagne houses for example. They’ve carefully crafted their luck, and they’ve done it well. You win an award for the most intelligent comment this year 🙂 Thanks so much – love your take on ‘luck’. I would love to taste some older vintages now. I would say that you were very lucky in your choices and I am a fan of both Opus One and Dominus. Ridge and Stags Leap are also two safe bottles in my book as well. I have never had Coup de Foudre so I cannot comment. Yes – agreed that I was really lucky to taste these wine 🙂 Try the Coup de Foudre if you get the chance – stunning wine. Great balance of geek notes and attentive tasting notes made this post a treat to read. French wine, especially Burgundy, remain the touchstone for wines for moi :). I’m treasuring this comment – it’s really hard to write tasting notes for someone else to actually enjoy reading. It’s such a personal experience that it’s like eating someone else’s dinner vicariously. You’ve made my day. The only good wine is the wine you like. I would love to taste some wines from Chateau Ste Michelle). What a lovely comment – a yomp of a read. You write superbly, how i love the English language. Born in France, raised in Bourgogne (Dijon), Côtes du Rhône (Valence), and now living in Lyon, (between Côtes du Rhône and Beaujolais), reading you makes me want to go on a vacation-tour of your top wineries! Thank you! Thanks Eugenie – I would love to go on that tour.